… says Diego Romero Heredero, doctoral student in Linguistics, about his guest stay travel grant by "a.r.t.e.s. international – for all"
With its mobility programme "a.r.t.e.s. international – for all", since 2014 the a.r.t.e.s. Graduate School has been able to provide different grants not only for the doctoral students of the Faculty of Arts and Humanities at the University of Cologne, but also for doctoral students from universities abroad. International doctoral students can apply for funding for familiarisation stays (up to two weeks), guest stays (up to three months) and conference participation stays (up to five days). 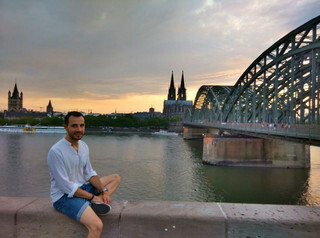 Diego Romero Heredero studied Linguistics at the University of Alcalá (Spain) and received a travel grant for a guest stay at the University of Cologne by “a.r.t.e.s. international – for all” in 2016. Since April 2017, he participates in the structured doctoral programme “a.r.t.e.s. Integrated Track” as a doctoral student. We asked Diego about his experiences at the university and were excited to hear his positive feedback! a.r.t.e.s. Graduate School: Dear Diego, last year you were able to get to know the University of Cologne with a guest stay travel grant by “a.r.t.e.s. international – for all”. How did you learn about the programme and the University of Cologne? Diego Romero Heredero: I had been working for two years on a project with Professor Klaus von Heusinger, from the Department of German Language and Literature II, and with Professor Marco García García, from the Department for Romance Studies. Therefore, l decided last year that a stay abroad could be beneficial for my thesis project and they both told me about the mobility programme of “a.r.t.e.s. international – for all”. I applied for a travel grant and received funding for two months at the University of Cologne. I think that German universities in general and in particular the Faculty of Arts and Humanities of the University of Cologne are currently one of the most leading research centers in Europe. How did the guest stay help you with your research and your academic career? Has your project benefitted from your stay in Cologne? From a professional point of view, the benefit of my guest stay last year has been extraordinary higher than I did expect. I worked at the Department of Romance Studies with Marco García García during the guest stay and were able to extend my stay after that period. Now I am studying at the University of Cologne as a doctoral student of the Integrated Track. Therefore, the professional balance is astonishing. For my research, both the colloquium of the Department of Romance Studies and the colloquium of the Cologne Centre of Language Sciences (CCLS) at the University of Cologne have been very useful because we discuss new methodologies, new approaches and new ways of working. This helps me to deal with my research with new tools. In addition, there are great experts in Linguistics at the University of Cologne from who I have been able to learn a lot. You are now also attending the a.r.t.e.s. graduate class 8 “Prominence in Language” with a.r.t.e.s. class mentors Professor Petra Schumacher and Professor Marco García García. What is your doctoral project about and how does the graduate class help you with developing it? My doctoral project “Interaction of nominal and verbal features for Differential Object Marking in Spanish” seeks to provide an explanation of which are the most relevant features that define the occurrence of DOM in Spanish and in which way they affect this phenomenon. At the moment we are looking at the concept of ‘Prominence’ in the graduate class. We try to consider different perspectives and different levels of language analysis. This kind of work is very helpful for a better understanding of our research, because connecting all the different concepts allows us to get a broader idea of what we are doing. I only joined the graduate class this year, but it is already a significant part of my academic life in Cologne. We thank Diego Romero Heredero for the interview!